The flag of the United States of America was adopted on 14 June 1777, less than a year after the country became independent and has adopted its Constitution (July 4, 1776), but the current flag dates only from 1960. It was preceded by a flag with horizontal red and white stripes, which bore,The flag of Kuwait was adopted on 24 November 1961. It consists of three horizontal bands at the wind green - white - red, and a black trapeze at the hoist. These colors are Pan-Arab colors, which represent : Black (The Abbasid Baghdad), White (The Umayyads of Damascus), Green (The Fatimid Cairo) and Red (The Hashemite house of Muhammad). But here the power of Kuwait wanted to give new meanings to the colors used, to customize the flag. These meanings from a poem that relate the enemies defeated by the people (black), the sword that made ? ?the blood flow (red), freedom and purity (white), and the fertility of their country (green). You can download it in different sizes, in a decidedly modern design for your personal use, or for wider use. Kuwait's flag is available in 4 different sizes. 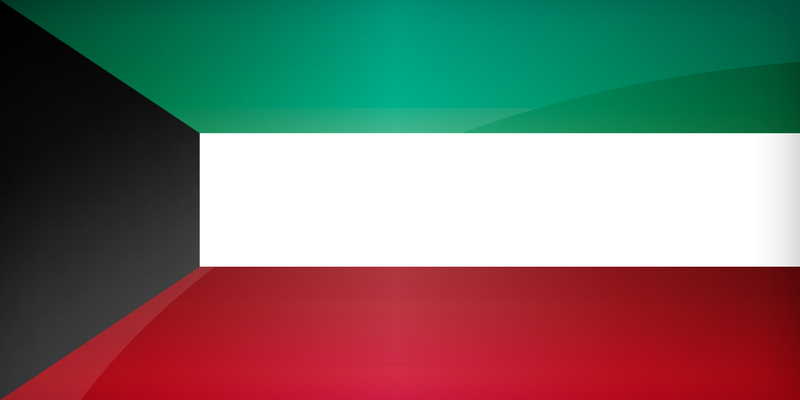 Keywords: Flag kuwait wallpaper, Kuwaiti, State of Kuwait, National kuwaiti flag, banner, pictogram, country, icon, Kuwait icon, international, Kuwait City, As Salimiyah, Sabah as Salim, Asia. This page has been viewed 5158 times.